on Thursday 31st December 2014 4pm. NOTE: In the event of extreme temperatures being predicted, the competition will be set back to later in the day. Cost: $5 per entry. Entry can be for one person, or a team. Registration at the seating by the toilet block (along from Candlagan Bridge). 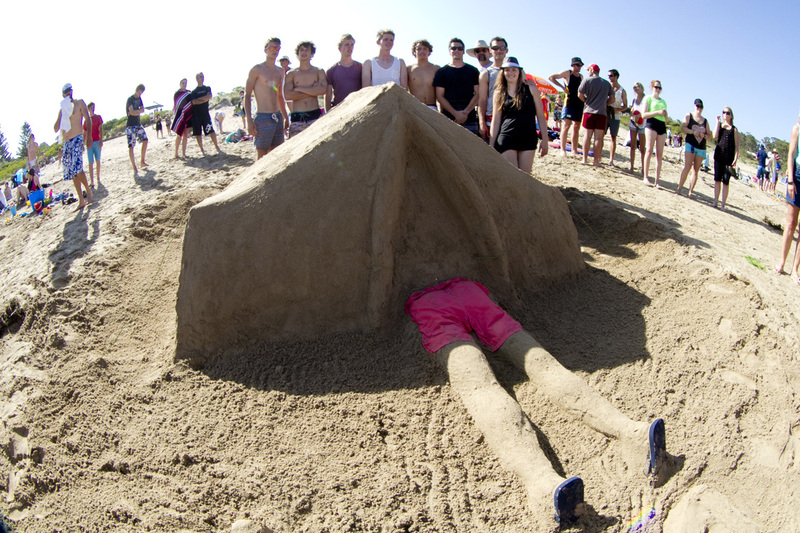 Categories include open and junior (primary school) in sculpture or sandcastle building. . Maximum 5 per entry except family or junior teams can have additional members under 5 years of age. No assistance from non-team members, except advice. No interference with other teams or their works. No walking on another team's patch. No use of tools other than plastic ice-cream containers and water spray bottles, and normal beach toys such as toy plastic bucket, toy small plastic spade, toy small plastic rake – organisers might approve of other odd items that are safe and don't give an unfair advantage. No workings before the start whistle. No workings after the full time whistle. (Most important) EVERYBODY HAS TO HAVE FUN! !